Update: I have posted an updated version of this story, along with an incredible picture of the crescent Moon just 10 minutes before it was new. Not a world-stopping bit of news, but cool and interesting: the youngest new Moon ever has been spotted. It was so young, in fact, that it was actually not yet quite new. Here's the deal: the Moon goes around the Earth (stop me if I'm going too fast). Once every orbit (roughly once per month) it passes near the Sun in the sky. The Moon's orbit is tilted with respect to the Earth's around the Sun, so it doesn't pass directly in front of the Sun every orbit, and sometimes it's farther "above" or "below" the Sun in the sky than other times. The Moon is officially new once it passes that closest point to the Sun in the sky. But think about it: it passes very close to the Sun (never more than 5 degrees, about the width of three or so fingers held at arms length). That means you have to do this observation while the Sun is up! Or just after it sets. Either way, this is no small thing. So what Martin Elsässer did was see the Moon before it actually passed the Sun, just five minutes before it was new. 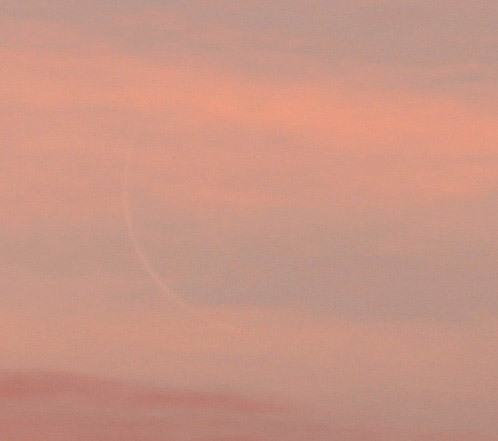 That image was taken when the Moon was still 19 degrees from the Sun. Imagine when it's 5 degrees! So hats off to Herr Elsässer. That's an amazing feat.